Sanford City Hall is located at 300 North Park Avenue, Sanford, FL 32771; phone: 407-688-5000. 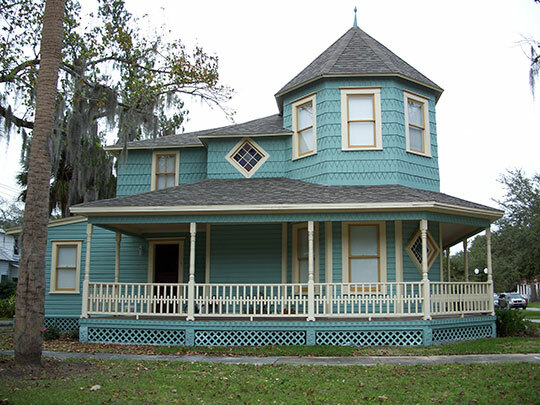 Photo: Home located in the Sanford Residential Historic District, Sanford, FL. The historic district was listed on the National Register of Historic Places in 1989. Photographed by User:Ebyabe (own work), 2007, [cc-by-3.0 (creativecommons.org/licenses/by/3.0)], via Wikimedia Commons, accessed July, 2013. In 1870 Henry Sanford bought land near Mellonville (then the county seat of Orange County) in order to begin creation of what he believed would become the transportation central hub for Southern Florida. Sanford was incorporated in 1877 and in 1883 Mellonville was annexed. Sanford established Belair, an experimental citrus grove where more than 140 varieties of citrus were tested. The local citrus industry was devastated during the winter of 1894-1895, but those who stuck it out regrouped and developed artesian wells and an irrigation system that fed the growing of vegetables. In the early 1900s Sanford had become one of the most productive vegetable distribution centers in the country, earning it the nickname "Celery City" after its most-abundant crop. Seminole County was established in 1913 with Sanford as its county seat. A U.S. Naval Air Station was in operation from 1942-1968, diversifying the population. After the base closure, the facility was developed into the Sanford International Airport. Sanford Historic Preservation Board, A Brief History & Walking Tour of Sanford, sanfordhistory.tripod.com, accessed October, 2011.